Sixteen Democrats join the Vermont independent's call for a costly remake of the U.S. health care system. WASHINGTON — In an animated, campaign-style rally, Sen. Bernie Sanders unwrapped his plan to remake the nation’s health-care system into federally run health insurance Wednesday – a costly proposal embraced by liberal activists hoping to steer the Democratic Party in upcoming elections. The Vermont independent’s plan would hand government a dominant role in insuring Americans, a crucial step, he said, in guaranteeing health care for all. Census Bureau data this week showed the proportion of people lacking policies falling to 8.8 percent last year under Obamacare, the lowest level ever recorded, but he called it an “international disgrace” that not all Americans have coverage. Though Sanders’ plan is going nowhere in the Republican-controlled Congress, he drew a big crowd to a Senate hearing room. Hours earlier, Republican senators unveiled their own last-ditch, long-shot plan to scuttle Barack Obama’s 2010 statute and sought White House help. Shortly afterward, Trump issued a statement saying “I sincerely hope” the effort by Graham and three other Republican senators will succeed. The waning desire of Republicans to revive their failed effort to scrap Obama’s law contrasted with growing, though wary, Democratic support for Sanders’ bill. It has attracted 16 co-sponsors, one-third of all Senate Democrats, though most are from safely Democratic states. 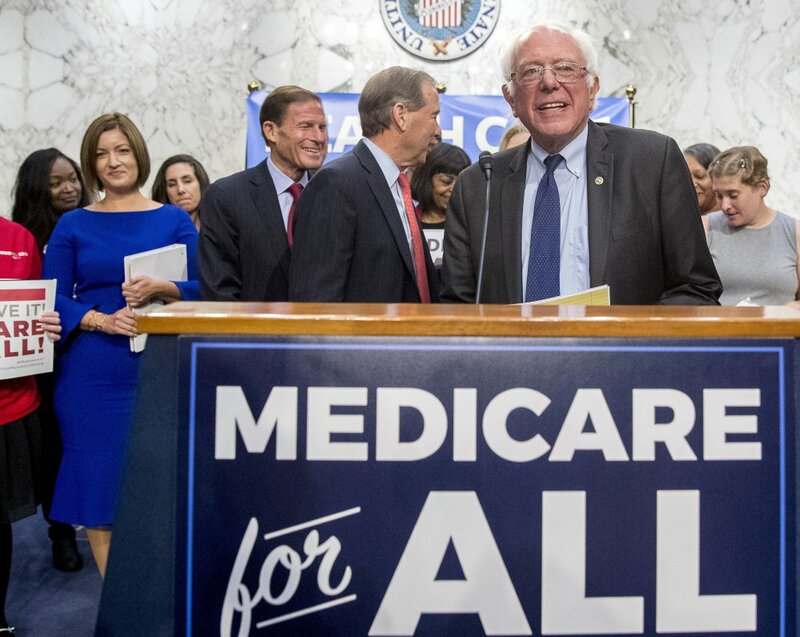 “Today we begin the long and difficult struggle to end the international disgrace of the United States, our great nation, being the only major country on Earth not to guarantee health care to all,” Sanders declared. Though his bill has no chance in the current Congress, the issue is enthusiastically backed by large segments of a Democratic Party hoping to capture House control in the 2018 elections. Sanders caucuses with Democrats and unexpectedly gave Hillary Clinton a tough run for the party’s presidential nomination last year. The room where Sanders spoke held more than 200 people, including members of unions and progressive groups. Many waved posters and chanted “Medicare for all,” the name he has given his 96-page bill, which would gradually expand the insurance program for the elderly to cover all Americans. Support among Democrats for Sanders’ bill and similar measures by other Democrats suggests the push for a single-payer system will be a major theme inside the party. “We will defend it at every turn,” Sen. Elizabeth Warren, D-Mass., another possible presidential hopeful, told the crowd about Obama’s law. “But we will go further.” Potential candidates Kirsten Gillibrand of New York and Kamala Harris of California also attended the event.